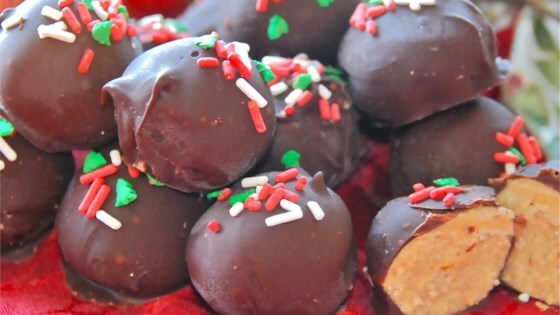 "My family makes these every Christmas, they're one of our favorites. The maple flavoring is the key ingredient!" Combine the butter, peanut butter, confectioners' sugar, vanilla and maple flavoring. Cream well and knead well. Melt the chocolate chips over low heat. Roll the dough into 1 inch balls. Dip into melted chocolate chips. Refrigerate overnight (or at least for about 15 minutes) on a cookie sheet lined with wax paper. This recipe is very yummy! I tried a few different recipes for Peanut Butter Balls from this website and this one is my favorite. These are the best Peanut Butter Balls I have ever eaten! The maple flavoring makes this recipe. I have tried other recipes with out the maple flavoring and none can compare!